Sci-fi fans are in for a real treat this month, with the release of The Divergent Series: Allegiant (Part 1) in Ster-Kinekor’s IMAX® theatres on Friday, 18 March. The release of the third instalment in the four-part series, The Divergent Series: Allegiant (Part 1) is great news for fans of this blockbuster franchise, who now have the opportunity to watch it on the giant IMAX screen. These action adventure films, featuring intricate storylines and bold characters, is based on Veronica Roth’s New York Times Best Seller. The film stars Golden Globe® nominee Shailene Woodley, Theo James, Zoë Kravitz, Miles Teller, Academy Award® winner Octavia Spencer and Oscar®-nominated Naomi Watts, and is directed by Robert Schwentke. The IMAX release of The Divergent Series: Allegiant has been digitally re-mastered into the exceptional image and sound quality to deliver a world-class IMAX Experience® with proprietary IMAX DMR® (Digital Re-mastering) technology. The crystal-clear images coupled with IMAX's customised theatre geometry and powerful digital audio, create a unique environment that will make audiences feel as if they are right there and a part of the action. After the earth-shattering revelations of Insurgent, Tris must escape with Four and go beyond the wall enclosing Chicago. For the first time ever, they will leave the only city and family they have ever known, in order to find a peaceful solution for their embroiled city. Once outside, old discoveries are quickly rendered meaningless with the revelation of shocking new truths. Tris and Four have to decide who they can trust, as a ruthless battle ignites beyond the walls of Chicago that threatens all of humanity. 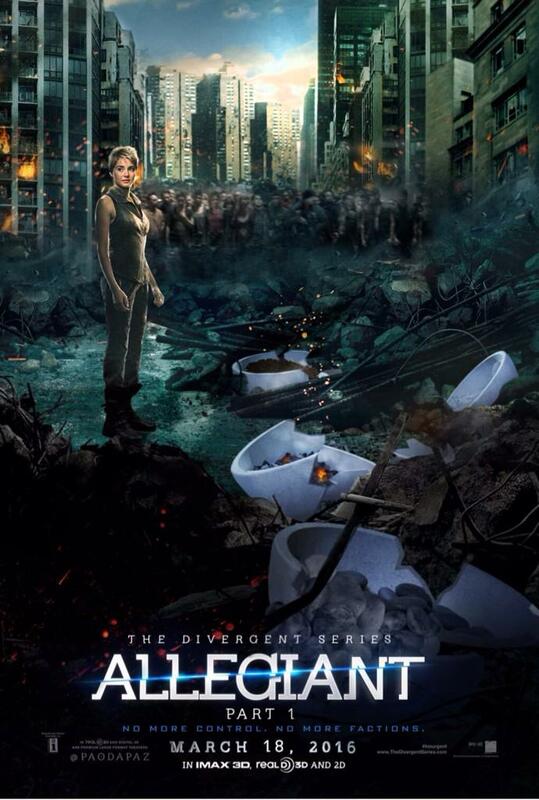 In order to survive, Tris will be forced to make impossible choices about courage, allegiance and sacrifice. Ster-Kinekor’s IMAX® theatres are at the following cinema complexes: Gateway in Durban, Baywest Mall in Port Elizabeth, Cape Gate in Cape Town, The Grove Mall in Pretoria, Cradlestone Mall in Krugersdorp and Eastgate in Johannesburg. For more information on Divergent in Ster-Kinekor and IMAX® cinemas, download the Ster-Kinekor App on your smart phone for updates and to book tickets from your mobile. To find out what other exciting promotions Ster-Kinekor has on offer, visit www.sterkinekor.com or sterkinekor.mobi. Follow @sterkinekor on Twitter or Ster-Kinekor Theatres on Facebook. For queries, call Ticketline on 0861 MOVIES (668 437) or book at the box office.